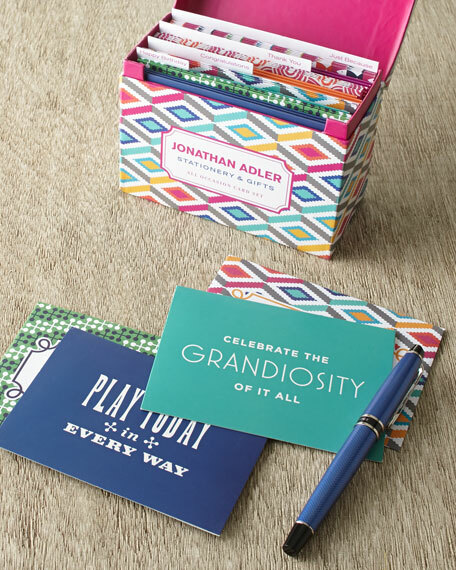 You are set for any occasion with these clever Jonathan Adler all-occasion notecards. You won't miss a beat when you have sassy stationery in stock. A great gift idea for coworkers. Set of 16 notecards and corresponding envelopes arrive in a decorative box. Assortment includes four birthday cards, four thank you cards, four congratulation cards, and four general correspondence cards. While the collection now includes everything from furniture to frames, it all started in 1994 with Jonathan Adler's first love: pottery. He was introduced to the art at summer camp when he was 12. With joyful colors, lighthearted patterns, and whimsical flair, Adler's aesthetic reflects his belief that your home should make you happy. His most ambitious projects include designing The Parker Palm Springs Hotel and a real-life Malibu dream house to commemorate Barbie's® 50th birthday.